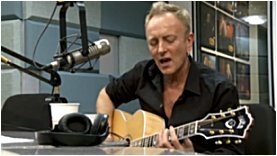 Def Leppard guitarist Phil Collen performed live acoustically on Q 104.3 radio in New York over the weekend. Phil played the same songs as his previous appearance - 'Hysteria' and 'All I Wanna Do' and was interviewed about Def Leppard and MANRAZE's latest activity. The possibility of new Def Leppard studio songs and the upcoming tour with Poison were mentioned. The Rock Of Ages movie was also discussed and MANRAZE. Phil hinted that one of Def Leppard's new songs could be used in a movie later this year. Watch the entire interview and acoustic performances below. Def Leppard tour/Any New York MANRAZE shows? "Def Leppard definitely but I don't know when that's gonna be. We're probably gonna kick the tour off late May, early June. We haven't got the dates yet. We haven't got - we're gonna take a third act but that's not confirmed yet. So it's all a bit vague but all we know is it's summer and it's Poison." "We really want to get out on tour, we think it's important this year because of the Rock Of Ages thing. There's a lot surrounding it and a lot of attention so we really want to get out on tour." New Album/Music from Def Leppard? "Certainly a new song or two. Just doing a whole album takes so long. Unless with MANRAZE - we done that album in two weeks. I think with Def Leppard we've just developed this thing over the years where we just take a long time in the studio. We get into this kind of routine where it takes ages. But I do think a new song or two maybe in a movie or something like that. We are working on stuff, we've got stuff in the pipeline. We just haven't got it done yet." Follow the link below to the show page for the setlist details and a gallery of pics.